Optic neuritis is one of the most common manifestations of MS, occurring in 14% to 23% of cases (36-39). Patients usually complain of dimming of vision unilaterally, generally accompanied by photophobia and pain aggravated by eye movement. Examination reveals diminished visual acuity of varying severity, and detailed visual field evaluation frequently shows a central scotoma (84). Visual loss is seldom total, and good recovery of vision usually occurs within six months, even when the initial visual loss is extremely severe (85,86). Fundoscopy may show a swollen optic nerve head with hemorrhages or exudates (papillitis), or a normal optic disk (retrobulbar neuritis). Even in the absence of acute optic neuritis, many patients demonstrate clinical abnormalities of optic neuropathy. This may be manifest by diminished visual acuity, impairment of color vision as detected with Ishihara plates (87), abnormal visual field examination, or a positive "swinging flashlight test'' (88) indicative of an afferent pupillary defect (Marcus Gunn pupil). Subtle abnormalities of vision may also be detected by the use of low-contrast sloan letter charts, even in patients with visual acuity of 20/20 (89). Fundoscopy may reveal optic atrophy. Visual-evoked responses will often be abnormal in patients who never had clinical evidence of optic nerve disease (90,91). Many patients experience bilateral optic nerve dysfunction, but blindness is relatively uncommon. Virtually, any type of visual field defect may occur in MS depending on the site of the inflammatory-demyelinating lesions. For example, recent reports have cited the presentation of the disease with bilateral homonymous visual field defects (92,93) and acute quadrantic field loss (94). 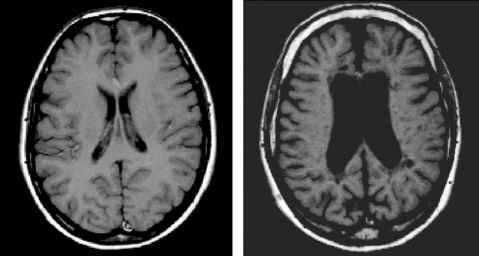 Others have reported similar deficits occurring in the course of MS and, as in the former reports, associated with anatomically appropriate lesions demonstrated by MRI.